The new BMW 5-Series looks leaner and meaner, and far removed from the overblown whale that it had become under BMW’s former stylist Chris Bangle. The new 5 Series is a clean-sheet creation with a lightweight body built off the same base as BMW’s new 7-Series limousine. It is, however, 58 mm longer than the previous model (4899 mm), while width is up 14 mm (1464 mm) and the wheelbase is 80 mm longer at 2968 mm. There are three new petrol engines - a naturally aspirated six-cylinder for the 528i, a turbo six for the 535i and BMW’s twin-turbo V8 for the flagship 550i, while the 520d diesel will arrive later. GoAuto in Australia, which has driven this new 5, reports it has active steering, which changes the gearing of the steering rack for easy low-speed maneuvering and had been standard on all models except the 520d, but is now part of an option pack that also includes rear-wheel steering. BMW has re-introduced the concept of rear-wheel steering, as seen previously in old Mazdas, Hondas and Nissans, with this new electronic system that allows for up to three degrees of turn. The rear-steer system is only available with the optional active steering system which allows for the amount of steering input to change, depending on the speed. This means a small input at low speed turns the front wheels more than it would at higher speeds. The suspension is an all-aluminium double wishbone at the front and a multi-link rear set-up that BMW calls an integrated V axle. It comes standard with regular springs and dampers, while the turbo-petrol versions are available with the optional Dynamic Damper Control that provides an extra-soft comfort setting as well as advancing the handling with adaptive front and rear anti-roll bars. The 520d runs a revised 2.0 liter four cylinder common rail turbo-diesel that produces 135 kW at 4000 rpm and 380 Nm of torque from 1900 rpm to 2750 rpm. Its 0-100 km/h time is certainly not high performance at 8.1 seconds, but the fact that it uses just 5.2 liters per 100 km on the official city/highway test is impressive. 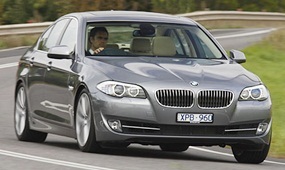 The 4.4 liter V8 of the 550i is the performer of the 5-Series range. It uses direct-injection and twin turbos to produce 300 kW at 5500 rpm and 600 Nm from 1750 rpm to 4500 rpm, which allows for a 0-100 km/h time of five seconds. The fuel consumption stands at 10.4 L/100 km, which is heavy but not excessive. BMW has moved to add the head-up display system, which projects information such as the speed and satellite-navigation directions onto the lower part of the windscreen, as standard on all 5 Series sedans. The extras list includes lane-change warning, active cruise control, heat-sensing night vision and two newcomers - Parking Assistant, which parks the car with minimal input from driver, and Surround View, which displays a bird’s-eye view of the car, using high mounted cameras, as a parking aid. The interior has evolved slightly with a next-generation iDrive control system and a seven-inch display on the centre console, facing the driver. Let us hope that this latest iteration of the hated iDrive is easier to use! Last week I asked what car, when shown for the first time generated 22,000 orders on the first day of the show? This was easy - it was, of course, the Ford Mustang. So to this week. How many finishers were there in the World Cup Rally of 1970? I was fortunate to get the following piece from a real wordsmith, Anthony Howard, by promising that I would make sure his name was written large, so here is a fascinating item about the World Cup Rally by TONY HOWARD. I have had to shorten it somewhat for reasons of space, so I hope he forgives me. “Once upon a time, back in the glory days, Fleet Street thrived amid rivers of alcohol, old Spanish practices, the chatter of telex machines and the unmistakable Linotype hot lead aroma. What kept this ramshackle thriller on the road was its firm grip on national advertising revenues and its prime position as provider of news and entertainment. However, national newspapers’ near-monopoly faced an increasing challenge as independent television began flexing its muscles from the mid-1950s. In 1970 a proposal was put for the mother and father of all motoring contests running from the previous World Cup venue to the next - London to Mexico City - in 1970? Next question: what kind of organization was big enough and silly enough to risk putting its financial muscle behind such a hare-brained scheme? Why, the Daily Mirror of course. As the complex, highly-politicized worlds of motor sport and the media converged the resulting ego clashes were analogous to the Large Hadron Collider. My good fortune was to be a Mirror foot soldier in the thick of all this, charged with maintaining rally news flow to the 22 countries from which the 106 entrants arrived. This involved crucial journalist skills such as smoking, drinking and keeping very unsocial hours - long before blackberries, sat-phones, wi-fi laptops, e-mail or digital photography. For I was captive between the varying time zones competitors were in from day to day and the deadlines of British and foreign media as far afield as Argentina, Australia and Thailand - all anxious for stories. To warm things up, the rally first took a brisk week-long 4,500-mile (7,300 km) tour of 16 European countries, an hour ahead of London. Once in South America, the remaining 11,500-mile (18,690 km) route was three to seven hours behind us, which mostly entailed waiting late into the night for any snippets that could be cobbled into stories and telexed to grateful distant recipients. So I lived just around the corner in the Waldorf Hotel for a month, and sustained my stamina by re-fuelling regularly at the Stab-in-the-Back, where there was a reliable telephone. Inevitably, the post-mortem found it was a jolly good jape that underscored the Mirror’s prestige with established readers and advertisers. But it could scarcely have built new circulation or revenues in Latin America or mainland Europe. Furthermore, Fleet Street rivals had essayed spoilers by sponsoring likely front-runners. Great events invariably evoke widely differing viewpoints. In his lavishly illustrated new book World Cup Rally, Graham Robson makes a pretty good fist of telling it how it was from the perspective of the on-the-road organizing team and the competitors. He was right in the thick of it as one of the rally controllers leapfrogging along the route. A former competitor and team manager, he is steeped in the sport, and as author of some 130 books he is a practiced hand at getting the words in the correct order. One of his main sources is ebullient rally secretary John Sprinzel, now 78, who made the first recce in South America. Robson visited Sprinzel at home in Hawaii, while others in his cast of characters read like a motor sporting Who’s Who from a golden age. Among them are Paddy Hopkirk, flying Finns Rauno Aaltonen and Hannu Mikkola (fresh-faced London-Mexico winner in The Telegraph Magazine-sponsored Ford), Stuart Turner (once Ford of Europe motor sport director), Peter Browning (former British Leyland competitions manager) and even HRH Prince Michael of Kent. As Sprinzel and his two compadres journeyed around South America attempting to transform a theoretical line on a map into a viable rally route, they encountered plenty of obstacles. Not least of these was the world’s longest mountain range, sitting slap-bang along six countries through which the rally was to pass - Argentina, Chile, Bolivia, Peru, Ecuador and Colombia. With an average altitude of 13,000 ft (4,000 meters), the Andes extend 4,300 miles (7,000 km) north to south and 120 miles (200 km)-430 miles (700 km) east to west. 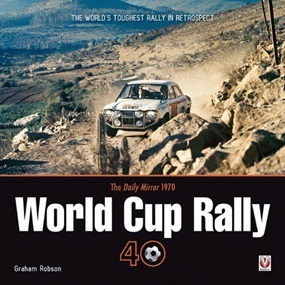 Robson’s World Cup Rally narrative zips along at a brisk tempo through the many twists and turns of an epic that began as a simple brilliant idea over a couple of drinks and took on a life of its own as so much talent, energy and money was thrown behind it.